Gorgeous Home inside and out! This Home Shows Like a Model! Floor plan features are 1700 Sq. Ft. 2 bedrooms/2bath, plus a Den. Your Guest will enjoy their Private Suite and Lovely Bath in this Split Floor plan. The Home Boasts Beautiful Granite Counters, Cherry Cabinets with Pull Out Shelves, Kitchen Island, Gas Stove, Black Appliances, Spacious Eat In Kitchen with Bay Window, Custom Paint and Window Treatments Throughout! Large Great Room is open to the Kitchen making this home an Entertainers Delight! Large Master Suite with Bay Window, Walk-in Closet, M/Bath has Double Sinks, Step In Shower and Private Water Closet. Private Den has Double Doors, use this as a Bedroom or an Office! 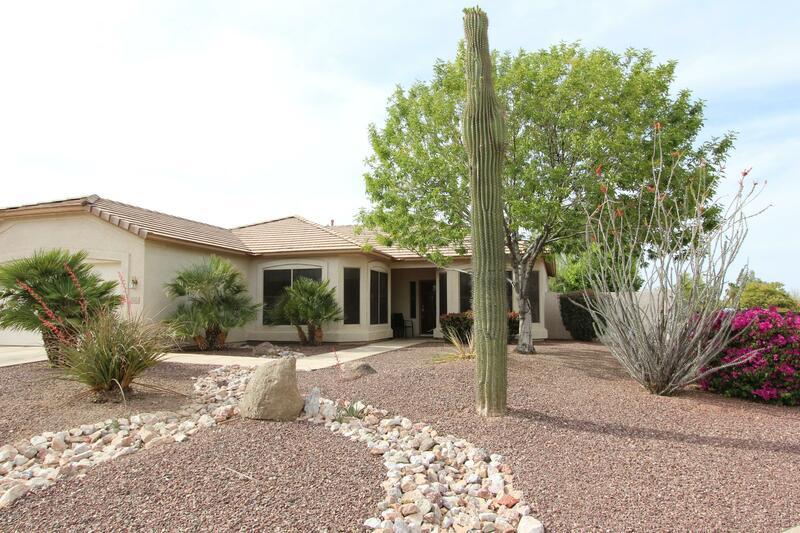 This home sits on a Large N/S facing Premium Corner lot. This home is a must see! The Home Is being Sold with Top of the line Furniture and Decor! This Furnished Model Home is what your buyers have been looking for! Just bring your personal items and Move In! Solera Chandler is a wonderful gated, golf course community that offers a lifestyle like no other, filled with Wonderful Amenities to Enjoy!